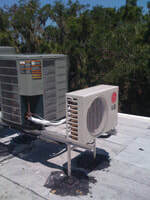 We install, maintain, and service air conditioning and heating units for residential and commercial customers. If you need service on your current home system, our experienced technicians can diagnose, adjust or repair quickly and at a fair price. With over 30 years of experience, Southern Comfort HVAC is well qualified and ready to help you with your heating and cooling concerns. Duct cleaning and sanitizing service. We also service all your commercial air conditioning and refrigeration needs, from walk in coolers and freezers to ice machines. The same experience is offered with a professional and efficient staff. We are on call 24/7 whenever you need us after hours.